Retired sales and marketing executive Sam Skobel had a plan in mind for a peaceful retirement home on a northern Wisconsin lake. We interviewed him to learn about his design inspiration for the home, specifically the kitchen, and the process to create this idyllic retreat. SRFD: Tell us about this home. Sam: This is a rustic-style (not rustic in the roughing-it sense) home on a lake with 500′ of frontage on a very private five-acre parcel of wooded land at the end of a dead-end road in northern Wisconsin. So very laid back and peaceful. We purchased the home in 2001 with the plan to totally remodel it prior to retirement, and then live there full-time. Over the last 17 years, we have remodeled, replaced, renovated and/or upgraded virtually all aspects of the home – only the original walls remain in place. For example, we upgraded the existing floors by replacing them with 110-year-old reclaimed pine and Douglas fir wood from a grain elevator in northern Minnesota. Very dramatic and a wow-factor of the first order. SRFD: What was your inspiration for the kitchen remodel? Sam: Being in the the northwoods of Wisconsin, loving the casual lodge-style type of decor and wanting to remain consistent with the design throughout the rest of the house, we chose the casual-but-elegant barn-board based style inspired by books, magazines, internet searches, model homes and retailer displays. It was very important to us to have the kitchen look high-end with a casual/informal feel, but without the typical minimalist look of many higher end kitchen designs. It’s the style of the whole house, and it’s the way we live. SRFD: Tell us about the kitchen remodel. Sam: The kitchen renovation began in March 2018 and, as planned, was the last step in the 17-year remodel plan. Similar to the reclaimed floors in concept and style, the custom cabinets are also reclaimed barn-board, very nicely complimenting but not imitating the floor. The countertops are exotic-grade, book-match granite with “rock-edge.” The sink and range hood are custom hammered-copper, as are the lighting and switch plates. The backsplash is 2″x4″ travertine brick-style tiles with hammered copper accent tiles. All cabinets have custom above and below cabinet lighting on dimmer switches allowing the mood to be fine-tuned. SRFD: Can you walk us through your design process? Sam: The design process was very difficult – mostly because of our location in extremely northern WI and the minimal availability of licensed and/or certified kitchen designers. As such, we tackled the design process ourselves. The process started with appliance selection, as those items dictated many of the cabinet/other dimensions and configurations. Regarding appliances, we chose Monogram appliances because we felt they had the best available features and benefits, and they far-and-away provided the best value. We included the 36″ panel-ized fridge/freezer, panel-ized dishwasher, wall oven, Advantium oven, 36″ rangetop and panel-ized wine refrigerator. Now that they’re in place we absolutely love them – especially the panel-ized refrigerator/dishwasher/wine refrigerator. They look great! After choosing appliances we selected our cabinet manufacturer, followed by the sink (a 30″ apron-front single bowl hammered copper) and matching 40″ hammered copper range-hood. Granite countertop selection followed next, with backsplash and lighting last. SRFD: What was the most challenging piece of the renovation? Sam: Without question, the most challenging part of the renovation was personally coordinating all aspects of the tear out-to-completion process. We were let down many times by various suppliers who just did not deliver as promised, both time and/or quality-wise. As a result the original time line (agreed to by all) of six to seven weeks turned into about 11-12 weeks. While in the long run the additional four weeks is not a huge deal, it did cause us to live in a “construction zone” for an extra month and, more importantly, was wholly avoidable. SRFD: What part did you enjoy the most? Sam: The part we enjoyed the most was, as I’m sure with most renovations, was watching the space come together and seeing the finished product. Because we totally owned the project from concept to design to execution to completion, seeing the transformation become real before our eyes was most rewarding. I guess I’d put it this way – it’s very satisfying to see an image in your head become tangible and real, and be the place you stand back, admire and live in.The finished kitchen is absolutely beautiful and is everything we could have wanted….and more! Earlier this year, Monogram was contacted by Coco from the popular interior design blog COCOCOZY. A Los Angeles native, Coco leads a double life – she is an executive by day and an interior design blogger and home furnishings designer by night. Coco shared her plans with us for the COCOCOZY Design House, her current renovation of an 1860 square foot Spanish style home in View Park, LA. We were so excited about the opportunity, we agreed to provide Monogram appliances for the kitchen. You can read more about the appliances Coco selected for the COCOCOZY Design House on her blog. Stay tuned for more photos as the renovation moves forward. Monogram has the pleasure of working with so many talented and impressive designers across the country. Sarah Nelson, kitchen and bath designer with Kowalske Kitchen & Bath, is a true design professional we enjoy partnering with, and wanted to learn a little more about her background and experiences. Sarah: My passion for design started very young. As a child, I would insist my parents “re-decorate” my room every six months … from the pillows to the paint color. It was always changing – thankfully, they embraced my hobby! Even as a child I knew that a room was not just a space. It was a place where memories were made. A room should not only be aesthetically pleasing, but also functional, inspire an emotion, and give off a feeling that makes you want to stay awhile. I use that motto everyday while working with my clients. I have been specializing in kitchen and bath design for nine years. At Kowalske Kitchen & Bath, we are a full-service design build company. From the design phase to execution of work. In addition, we cater to numerous other projects that include whole house transformations. SRFD: Tell us about a recent project. Sarah: Currently, I am working on renovating a 1940’s lakeside cottage. I wanted to keep a lot of the details that would have been original such as the hardwood floors throughout (which were in great shape), arched doorways, and moldings. We kept finishes cohesive due to a smaller, cozy floorplan. However, we did not skimp on any details! Painted cabinets with mullion glass doors, Brazilian quartzite countertops, bead board throughout, made-to-order etched chandeliers, custom iron railings, and a collection of items from the clients’ European travels. It will truly be the charming cottage it once was. Sarah: I am excited to see the use of stained cabinets again instead of painted. I will say, a painted white kitchen is SO timeless and classic. Of course it’s always beautiful! BUT I am loving the look of lighter wood tones paired with a printed bold tile. It tends to look more livable and unique. Another trend I look forward to is more metals-gold/brass, rose gold, etc. SRFD: Tell us about your experience with Monogram. Sarah: We had worked with Monogram to create a working showroom display. The goal was to design a kitchen that could appeal to many different tastes. It was a blank space and we wanted to showcase our products with an emphasis on the appliances. It includes a 36” dual fuel range with matching vent hood, the integrated fridge and freezer columns (which have a surprising amount of storage) and the 30” Advantium convection/micro. The microwave convection oven has been most popular as it has many functions, whether it may be heating up a cup of coffee quickly or cooking a full meal. We have enjoyed every aspect! Monogram as a whole appeals to our clientele based off their ability to provide innovative products, transitional sleek designs that accommodate any desired style, and a strong customer service team with a lot of knowledge. Monogram recently debuted a Column refrigerator door panel artfully conceived by style and fashion icon Zac Posen. With intricate details from the charcoal mirror finish to the fabric inspired details, Zac Posen’s door panel exudes sophistication that will help its owners realize the endless opportunities for custom design. The Monogram column is expertly engineered with LED interior lighting, autofill pitcher and WiFi connectivity. Monogram was on the road again in February, this time for Modernism Week’s signature annual event that celebrates midcentury modern design, architecture, fashion, art and culture. The celebration is held in beautiful and sunny Palm Springs, California, and includes over 350 fabulous events. These events range from the Modernism Show & Sale where Monogram exhibited our luxury appliances to signature home tours, films, nightly parties and so much more. Being the only appliance brand at the show, Monogram sure drew a crowd with special thanks to our Executive Chef Jon Lidell. Jon flawlessly demonstrated the effortlessness of our signature Advantium speed cook oven and 36” induction cooktop with gourmet bites for the masses all weekend long. You know you have the perfect chef when even seconds aren’t enough for the crowd. It’s safe to say that we converted plenty of consumers not only to be induction and Advantium lovers, but Monogram supporters as well. After such a successful weekend, what’s the best way to celebrate in Palm Springs other than the legendary Twin Palms Frank Sinatra Estate? Thanks to our Designer Engagement Leader for the West, Elise Raydo, the night was exquisite. The intimacy of the gathering in such an iconic setting, where Sinatra’s original recording equipment is still held, had the Monogram team and guests in complete awe. Every bathroom except one was the original and almost all of the furniture was historic, which made you feel as though you were truly celebrating with Frank himself. Jon Lidell served up some lovely bites for appetizers made in our pizza oven and the what seemed like endless courses served by Workshop Kitchen + Bar outside by the piano shaped pool were to die for. Talk about Elevating Everything! The gas cooktop generally goes unnoticed in the kitchen—that is, until now. On a mission to Elevate Everything, Monogram has taken this often-overlooked kitchen appliance and turned it into a focal point and a source of pride with finely crafted materials, innovative technology and the power to boil fast and simmer ultra-low. Available in 30- and 36-inch models, the Monogram Gas Cooktop features five burners with brass accents, stainless brushed knobs sealed with sapphire glass with an LED light indicator and linear grates that provide a sleek, contemporary appearance. The 36-inch model also features an LED timer, a rarity among gas cooktops. Ever left home wondering if you turned off an appliance? With the Monogram Gas Cooktop, owners don’t have to wonder because they can monitor the cooktop status using a smart device. The WiFi feature also enables owners to set timers from smart devices, while Bluetooth enables a connection between the cooktop and the vent hood. Crafted with only the finest materials, Monogram Gas Cooktops are built to stand the test of time, even for those who put their cooktops to the test morning, noon and night. Featuring the refined quality of four dual-flame burners with a 20,000 BTU center burner, this powerful cooktop allows owners to boil fast and simmer ultra-low for delicate foods. Those looking for pizzeria-quality performance in an oven specially handcrafted for the home can achieve the perfect slice with the 30″ Monogram® Pizza Oven. Now available in two striking styles, this indoor electric oven makes a bold statement with its dimensional design and lower vent system, or it can blend seamlessly into the lines of surrounding cabinetry for those who favor a subtle façade. Introduced in 2016, the Monogram Pizza Oven combines the crisping performance of traditional coal- and wood-burning ovens with the precision and elegance of a sophisticated stainless-steel appliance. From touch LCD controls preset for multiple cooking options (including flatbreads) to perfectly placed electric heating zones, every aspect of this elegant pie maker is expressly designed to meet or exceed the capabilities of the best restaurant pizza ovens. Fits a standard 30-inch wide cabinet cutout and requires no additional ductwork or ventilation. WiFi-enabled for use with Amazon Alexa, Google Assistant and Drop. Additionally, timers and mode changes can be made in an instant using the mobile app. Each component is handcrafted by true masters of their art down to the last detail. On a mission to Elevate Everything in the kitchen, Monogram has redefined luxury with its line of refrigerators and freezers that can be mixed, matched and relocated to reflect the style, personality and needs of the owner. Monogram Columns can blend seamlessly with cabinetry and are thoughtfully designed with industry-exclusive features and only the finest materials inside and out. On the inside, owners can see and feel the difference from the glass shelves and accents to warm lighting that casts an appealing glow. On the outside, the Monogram Columns line gives designers the freedom to create an elegant space without boundaries. Monogram Columns is also the only product line in its class to offer smart, connected features that put owners in control anytime, from anywhere. Monogram Columns enable designers to separate appliances, double up on refrigeration or freezer space and even tuck away appliances that are used less often. For retrofits, two Monogram Columns are also designed to seamlessly fit 42-inch or 48-inch openings without the need for cabinet or electrical modifications. Need another reason to believe that Monogram is Elevating Everything in the kitchen? We have it for you. 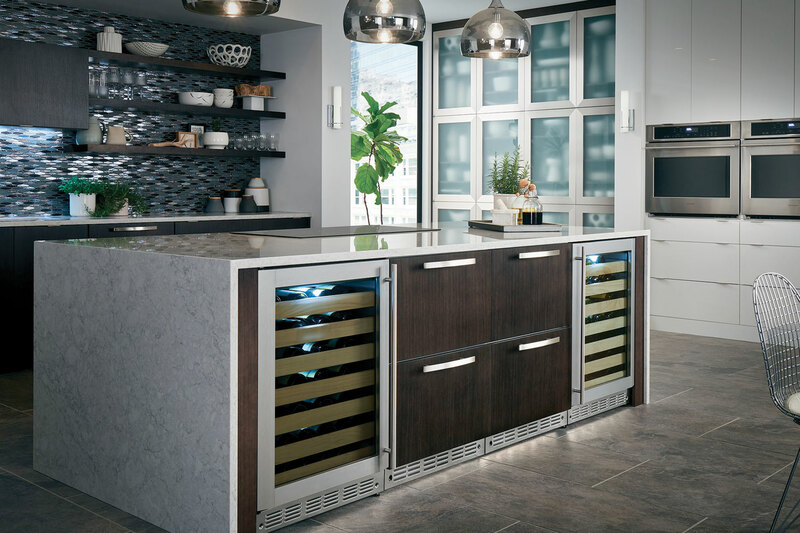 Meet the exclusive Monogram Kitchen Island that was debuted at KBIS this January. Monogram transformed a typical meeting room into a retro, speakeasy-styled, VIP lounge with the lit up Kitchen Island as the focal point of the dimly lit space. The brand went all out with Flapper girls, signature cocktails, delicious hors d’oeuvres, and of course, a cop to break up the “prohibited” speakeasy party at the end of each exclusive session. So what exactly is the Monogram Kitchen Island? Brought to the KBIS show as a concept piece to get feedback on how we can perfect this luxury item before the launch, it’s a multi-functional 3.6’ x 7.87’ sheet of the finest black glass-ceramic that is much more than just your standard kitchen island. The elegant Monogram Kitchen Island includes fully integrated induction cooking technology. Therefore, the entire surface is seamless, but has the Monogram five burner induction cooktop with glide-touch controls built right into part of the sheet of glass. This means you can also utilize the WiFi capabilities of our exclusive First Build induction cooking probe for sous vide cooking to achieve perfect cooking results every time you cook. The Kitchen Island also includes a warming zone built into the island that’s perfect for entertaining your guests, whether it’s warming appetizers or keeping your chocolate at the perfect temperature for fondue. Since all of this technology is seamless, when you’re not cooking, the entire surface acts as your island countertop, workspace, or favorite spot for poker night with friends. However, it doesn’t just have induction cooking technology built-in. The 6 mm thick glass ceramic also has wireless charging capabilities in spots throughout it. So not only can you charge your phone by laying it on the wireless port, but it can also effortlessly power your cordless countertop appliances that are becoming more and more common in everyday consumer’s homes. Talk about wowing your guests in so many ways with something that none of them have. While this debut of our Monogram Kitchen Island was a concept, we plan on launching the luxury appliance by 2019 due to the overwhelmingly positive response we got at KBIS from designers, dealers, builders and more. Stay tuned for the final launch details on exactly how big it will be, what color options will be available, what shapes it may come in, and what other exciting capabilities could get added to the centerpiece that could Elevate Everything in the kitchens of tomorrow.